This is the season of holidays for other people. First, I was buying Mother’s Day gifts. Then I’m looking for Father’s Day gifts. There are several graduation days on the calendar and a few wedding days, too. So I’m throwing out an idea for a new holiday: Me Day. Or maybe even Me Month. Hear me out. Unless we take care of ourselves, we’re no good to anyone. Get a full night’s sleep every night for a month. Can you even imagine that? I’d be happy to just get a full night’s sleep two or three days in a row. Your mood, productivity, relationships, waistline, EVERYTHING would improve. So many sleep studies have linked our bad sleeping habits to poor performance at work, car accidents, anger, depression, not to mention heart disease, diabetes and obesity. This one step could change the world. 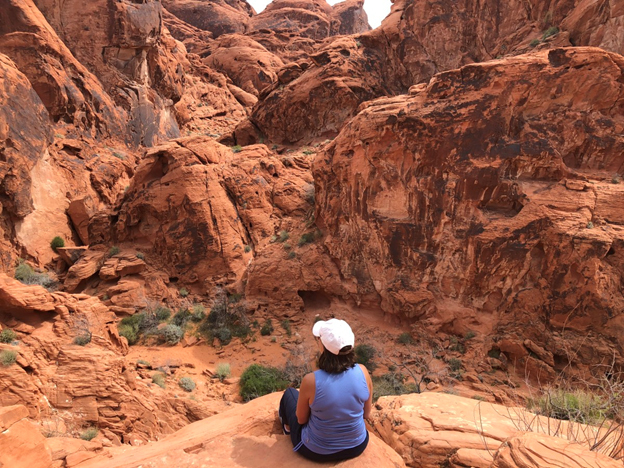 That’s me meditating in the Valley of Fire near Las Vegas. Meditate every morning. It doesn’t have to be 30 minutes. Even five minutes can change the course of your day by putting things in perspective. I know when I really commit to a morning mediation on a daily basis my day starts off with more energy and balance. I just feel happier. And there are so many meditation apps now that can help you through the process. And you can meditate anywhere. Move. If you want to transform your body, mind and spirit—go for a walk every day. Stretch, do yoga, go for a run. It will boost your energy and help relieve anxiety and stress. Don’t move. Make sure you also carve out time in your day to relax and restore. It doesn’t have to be a nap. It’s just a conscious slowing down. This is the hardest one for me. I need to make a conscious commitment to doing less. Say no. I don’t think I even know how to pronounce the word “no.” But saying yes all the time is killing me. Saying yes is a great excuse not to take care of yourself. So during Me-Month I’m simply not available unless the request aligns with my mission and values. Sure, I’ll still have to work and keep up with responsibilities, but during certain sacred hours: early in the morning, during my normal workout time, and in the evenings, sorry, the answer is no. Get to the doctor. It’s the last thing we have time for. Too many of us wait until we’re sick to get the care we need. And if you’re like me, you’re overdue for everything. I’m overdue for the dentist, the gynecologist, I still haven’t scheduled my physical, my mammogram (which is months overdue) or a bone density test. Last year my doctor gave me the paperwork for a colonoscopy and I never followed up. It’s on my to-do list every single day and yet, I never make the call. One hour at the doctor could add years to my life and help relieve any worries. During Me-Month all appointments will hereby be scheduled. If we all get better in touch with ourselves, we’ll be way better at getting in touch with each other. Let me know what you think of Me-Month. I can already envision the Hallmark cards we could send to ourselves: “In a world of change…open the card…Thank you for being my only constant.” Or just “Thinking of You Me! In order to stay healthy, you need to stay active and engaged. In addition to exercise, good nutrition and sleep, you also need a good dose of adventure. So each month I’ll share ways to boost the excitement and passion in your life with adventurous ways to create more wellness in your body, mind and your spirit.